Epson TM-T70II - ENN8.5, Bluetooth. Includes PS-180 power supply. iOS, Android, and Windows Compatible. Epson's mPOS-friendly TM-T70II POS printer, with its small size and low height (only 4.49" high), is designed to fit under a counter, in kiosks and other small spaces. It features fast printing of up to 250 mm/second, industry-leading reliability, dual interfaces and more. And it supports all the leading mobile operating systems including iOS, Android and Windows. 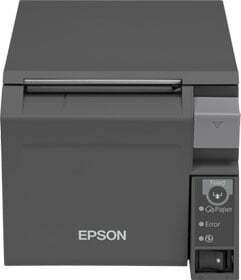 The Epson C31CD38981 is also known as Epson POS Products	C31CD38981	.